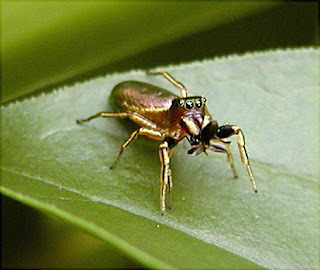 Tutelina elegens my mystery iridescent jumping spider. *^^* Photo from Bugguide. .......until today where I accidentally came across a photo of it on Bugguide and got the name. It doesn't seem to have an English name (otherwise BG would've listed it) and on Bugguide only list Tutelina similis as a similar species and mentions that it's impossible to ID the 2 species as spiderlings since they're so alike. These I've seen like crazy this year. Both adults and spiderlings of various stages. I don't know exactly what is going on here but it's fascinating. Where are they all coming from? Along with Cheiracanthium inclusum are a plethora of other tiny unidentified spiders. Quite a few of which are absolutely gorgeous. The others are your tiny ordinary/mystery/cuties who's life mission is to never be identified. I thank God I have a photographic memory. As some of these "ordinary cuties" are not so ordinary once a better look is taken. The last one was tiny and fat (abdomen wise) and the cephalothorax was a light tan color, the legs I don't remember (I'd imagine the same color more or less) and the abdomen was shiny black with silver designs on it. It was tiny but Idk if it was just a small adult something or an immature something. I hope to see one again in the future and have a micro camera at the ready. I want to know what these are. I've seen them before along with the larger red ones. But don't know what they are. I have theories but I'll have to debunk some due to obvious differences.........I think. As for C. inclusum after finding the last one in my bathroom doing it's business with me (beforehand it was on the ceiling in the hallway) I went and did my homework. My research on these shall be mentioned in another blog entry as I've rambled enough. God I love my little friends. ♥♥♥♥ Happy Halloween! I'm afraid od this animals!